So, what do you drink when you can’t feel your face? VODKA. Well, yes, but this is a wine blog folks, so I am thinking more along the lines of full-bodied red wines. Before I go on, let me first apologize to my fellow wine geeks for this heresy. It is terribly uncool here to champion rich, dense, dark fruited red wine. There seems to have been a secret committee meeting amongst local wine writers and sommeliers whereby it was decreed: crisp, light wines good/ big, bold wines bad. I guess my invitation was lost in the mail. Don’t get me wrong, I love the lighter reds too. If I was on a desert island, and I could only choose one red wine region for the rest of my life I’d pick Burgundy in a heart beat…but it would be hot on this island. I don’t know about you, but when my fingers and toes feel like they might fall off, I don’t want a chilled Beaujolais. I want something that is going to light a fire in my belly; something with such rich, luscious fruit that I almost believe it will be summer again one day. What I don’t want is a sweet, oaky, fruit bomb, with alcohol so fiery it tastes like kirsch. It is these wines that have given the full-bodied, high alcohol red category such a bad name in wine connoisseur circles. The missing element to these heavy, clumsy wines is balance. Imagine a see-saw, or a two-sided weighing scale. On the one side, you have sweet, ultra-ripe fruit and high alcohol. In order to achieve equilibrium, you need an equivalent level of vibrant acidity. When these elements are in harmony, the fruit becomes brighter (less cloyingly sweet), and the alcohol is far less perceptible. This is, of course, an oversimplification. There are far more factors at play. Not the least of which is the quality of the tannins. In a well balanced wine, they can vary from soft to quite firm (depending on the grape variety), but are smooth. That is to say, lacking the unpleasant bitterness or astringency they possess when under-ripe. But how to find these wines amongst the vast selection on liquor store shelves? One solution is to seek out hot, sunny regions with cooling influences. Factors like a refreshing maritime breeze, or high altitude, can slow the ripening process. The vines get plentiful warmth and sunshine for optimal sugar accumulation through-out the day, but at night, cooler air halts plant respiration and metabolism, allowing acid levels to drop more gradually. This drawn out grape vine maturation also allows tannins (naturally occurring compounds found in the grape skin, stems and pips) more time to fully ripen. Central Otago is a mountainous, inland region whose vineyards are the most southerly in the world. This land of extremes boasts the coldest winters, and the hottest day time summer temperatures, in all of New Zealand. The vines are planted on steep slopes, as high as 420 metres in altitude. They enjoy abundant sunshine during the day, with thermostat readings regularly exceeding 30°c. However, at night, temperatures can plummet to as low as 10°c. The region also has high UV levels, resulting in thick skinned grapes. Thicker skinned grapes have greater concentrations of polyphenols (compounds responsable for colour pigmentation, many of wines flavours, and tannic structure). Therefore, depending on winemaking procedures, thick skinned grapes tend to produce dark coloured, fragrant wines, with robust tannins. Pinot Noir is King in Central Otago. While this variety is generally known for its pale, lighter bodied reds, here the wines are richly coloured, intensely aromatic, and bold in structure. Flavours range from ultra-ripe dark cherry, and plum, to crushed raspberries, with hints of thyme. They are vibrant, fresh, and highly concentrated, with smooth, ripe tannins. The Southern Rhône valley is famed for its sunny, mediterranean climate and rich, powerful Grenache, Syrah blends. Châteauneuf-du-pape is the most acclaimed, premium appellation. The double effect of the baking hot sun, and the large, rounded stones that adorn the vineyard floors, reflecting light and warmth back up to the vines, make for massive, velvetty smooth, alcoholic reds with raisined fruit. Looking for something similar, but with a more vibrant, fresher fruited character? Gigondas is the answer. The vineyards surrounding this tiny town are perched on the edge of the Dentelles de Montmirail mountains at 100 to 430 metres in altitude. Temperatures are marginally cooler here. On the rare wintry days I experienced while living here, there was often a layer of snow in Gigondas, whereas just 5km away in the lower lying Vacqueyras, and Châteauneuf-du-pape, the fields remained green. Pockets of sandy soils at the foothills, and limestone-heavy areas further up, also contribute to the fresh, elegant style of the grapes grown here. The Uco Valley, at the foot of the Andes mountains, is located in the upper reaches of the Mendoza region. Vineyards are among the highest in the world, at 800 – 1100 metres. Poor, free draining soils encourage vines to dig deep for moisture and nourishment, resulting in low yields and highly concentrated wines. The favourable climate conditions (hot, sunny days, cool nights, high UV levels, and long, dry growing season) has attracted many prominent French wine producers to set up shop. 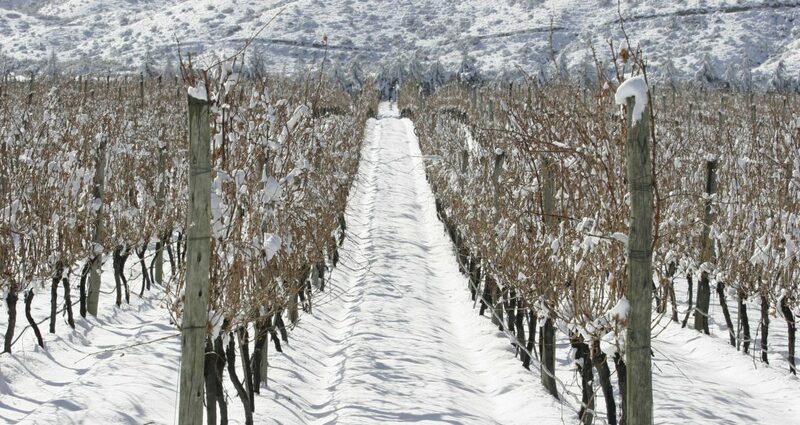 Further north, on the banks of the Mendoza river, lie the vineyards of Lujan de Cuyo. Sitting at 1000 metres in altitude, with cooling alpine breezes, this hot, dry sub-region also benefits from significantly cooler night air. Malbec is the major grape produced here*. The wines are dark in colour, with lots of body, and velvetty smooth tannins. The Uco Valley examples are wonderfully vibrant, with elegant floral and ripe dark fruit aromas. Lujan de Cuyo wines are almost black in colour, and equally dense on the palate. Ultra-ripe black fruits, exotic spice, and mineral hints feature on the nose and palate. * Cabernet Sauvignon and, increasingly, Cabernet Franc, also show great promise here. The vineyards of the Ribera del Duero are located in the Castilla y Leon region, due north of Madrid, and south west of Rioja. The vineyards are planted on a high plateau, 600 to 800 metres above sea level. Hot, sunny days are tempered by chilly nights, thanks to the region’s elevated position, and to regular cold winds. Day-to-night temperature can vary by more than 50°c. These dramatic fluctuations allow for a very gentle ripening pace. Grapes are generally not harvested before late October. The Duero river divides this semi-arid land, providing a much needed water source for the vineyards to thrive. This is red wine country. All blends must be composed of at least 75% Tempranillo (locally referred to as Tinto Fino or Tinta del Pais). The balance can be made up of Cabernet Sauvignon, Merlot, and/ or Malbec. Up to 5% of Garnacha, or the indigenous Albillo, can also be used. There are strict rules on wine ageing before the wines are bottled and released for sale. The levels range from: Crianza (2 years’ ageing, minimum 1 year in oak), Reserva (3 years’ ageing, minimum 1 year in oak), Gran Reserva (minimum 2 years in oak + 3 years’ in bottle). At their best, Ribera del Duero reds are inky black, highly concentrated and full-bodied. Intense aromas of dark berry fruit and mocha are underscored by attractive French oak nuances (toasty, spicy notes). They are very fresh, firmly structured, but smooth, with elegant, polished tannins. A mere 90 minutes north of Los Angeles, lies the vineyards of Santa Barbara county. The topography of this region is unique, in that the valleys run east to west, rather than the more standard north to south. There is massive diversity to be found here in terms of soil types and microclimates. The vineyards located on the eastern foothills are cooled by fog and ocean breezes funneled through the surrounding hills and mountains. Appellations such as Santa Maria Valley, Santa Ynez Valley (especially the Ballard Canyon sub-zone for Syrah), and Sta Rita Hills, are gaining prominence. Pinot Noir is the most planted red varieties in Santa Barbara County. It is generally dark in colour, with dense, powerful structure, and impressive depth of flavour. Very fragrant on the nose; brimming with black cherry, plum, and floral aromas. Syrah is also gaining in prominence. Imagine a mid-way point between a jammy, lush Shiraz and a crisp, taut Northern Rhône Syrah. This is a common style here. Rich, ripe dark berry fruit, lively acidity, full body, smooth, rounded mouthfeel, and firm, elegant tannins.